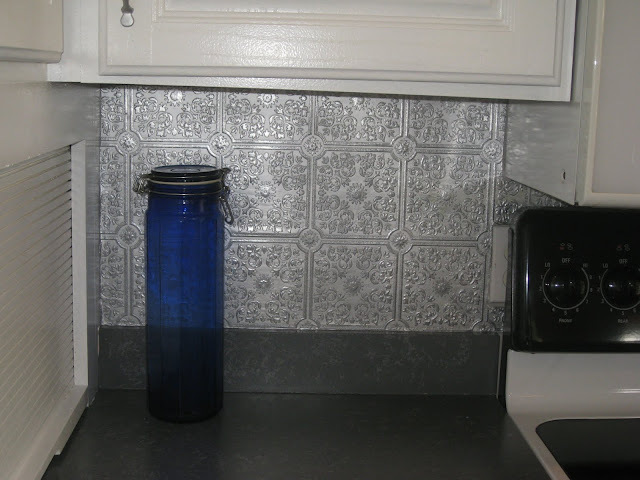 Kammy's Korner: Kitchen Makeover Part II: The Faux Tin Backsplash for 25 cents! Kitchen Makeover Part II: The Faux Tin Backsplash for 25 cents! 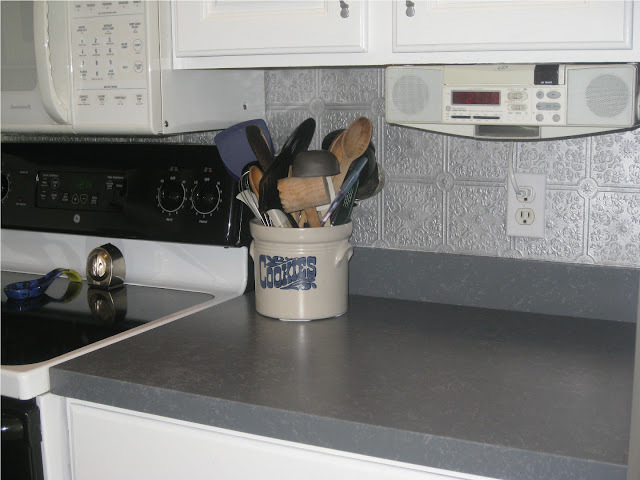 The 25 cent back splash!! Yippeeeee!! Can't say I've ever had a "back splash" per se, just painted it the same as the walls! Shall I even go so far as to admit, I never really thought about doing cool things on that space of the wall until a few years ago? 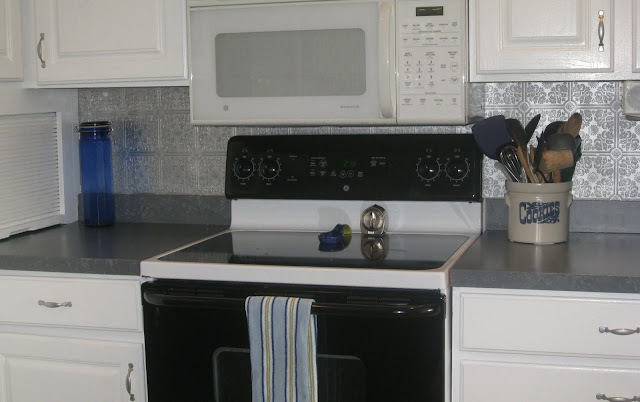 Back splash? What's a back splash? enough time allotted for about 2 errands. As I'm coming in to town, there is a big sign spouting "Rummage Sale". I'm still a recovering garage sale addict, so slips now and then are inevitable. I stop. Amidst my amazing finds was a huge roll of paintable wallpaper!!! For a QUARTER! I was thinking that stuff might make a neat back splash, and I was even willing to pay for a roll at Lowes. It always pays to stop, no matter how big of a hurry you're in! Mom measured and cut it down to the size needed, then I took it outside and spray painted it silver. We used Elmer's Glue mixed with a little water to adhere it to the wall. Afterall, we're into using what we have on hand, and wallpaper paste is not something I had on hand! Hi Kam, I actually did this same thing in my kitchen last year only in a copper finish. I love it!! Your kitchen is beautiful!!!! This is beautiful! Question, after having it up on the walls since Sept how has it worn with wiping down removing cooking splatters etc? Thanks! Mindy, oh boy... dare I say, admit... that I really haven't wiped it down much? I cook at home almost every day I swear, but I use the countertops on the other side of the kitchen I guess... and I'm not a clean freak! (I wish I was!) Okay, let me get off the computer and go clean my kitchen! haha. Now this is something I might have to try, and I just happen to have a roll!Yours looks great-I wonder if I sprayed it with a clear cote it would clean better-hmm. 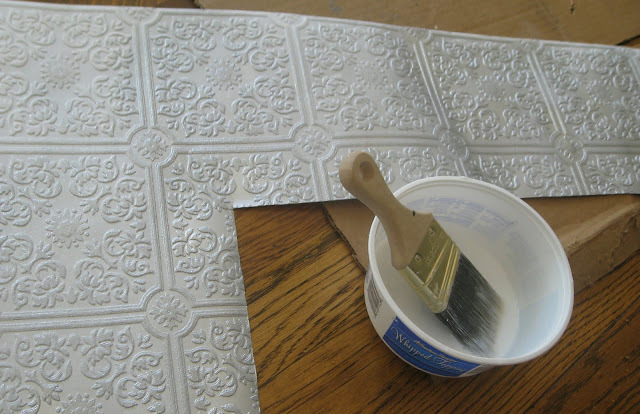 What a deal on the wallpaper and that was great thinking to paint it silver too! It looks wonderful! WOW! Looks great and I like the silver color. Amazing find. I love your back splash!! How has it been holding up? I'm considering doing this in my kitchen and would love any insights :).